Rei Kawakubo sticks her finger in the wind and nails the moment, demonstrating the enduring outsider status of camp. 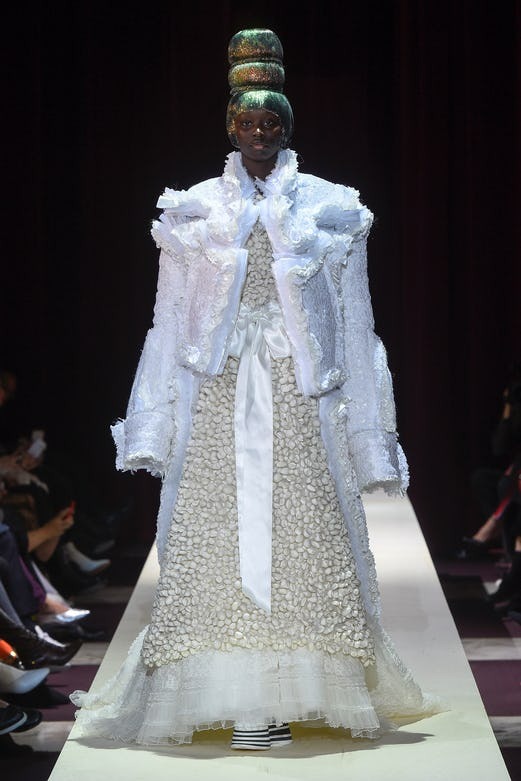 PARIS, France — Something felt very different at the Comme des Garçons show on Saturday.​ ​Before we’d even slipped through the red curtains that swathed the entrance, Adrian Joffe, Rei Kawakubo’s husband, had said the key word of the new collection was CAMP. As in the joyous celebration of artificiality that Susan Sontag nailed in her sensational 1964 essay “Notes on ‘Camp’”. Joffe added that Kawakubo wanted a theatre as the venue for her new show. Curtains, too. Inside, there was more red velvet, with two huge theatrical klieg lights suspended above the catwalk. So that was before the show. Afterwards, Kawakubo greeted guests with a warm handshake and a “Thank you for coming.” No longer the inscrutable sphinx. Instead, she said, “I wanted people to be happy.” They were. Deliriously so. What happened in between was one of those intermittently prescient situations where Rei Kawakubo sticks her finger in the wind and nails the moment. Going back to Sontag for an instant, she wrote in 1964, “Camp is the consistently aesthetic experience of the world. It incarnates the victory of ‘style’ over ‘content’, ‘aesthetics’ over ‘morality’, of irony over tragedy.” What Kawakubo extracted from Sontag’s words was a feeling that camp could embody an enduringly rebellious spirit, in defiance of hidebound orthodoxy. So her collection was exactly the joyous celebration of artificiality that Sontag wrote of. The music was Nino Rota’s soundtrack for Federico Fellini’s film La Strada, detailing the tragic travails of a travelling circus. Then it was the operatic drama of Profokiev’s Romeo and Juliet. Emotional, big, in other words. And the bigness carried over into the clothes: massed petticoats, polka-dotted lumps and bumps, rolls of fabric making huge rosettes, a glittering red showgirl outfit dissected and mounted like a trophy on a red tulle foundation, a big fairytale STAR, and a huge mille-feuille of fabric which brought to mind the fairytale of the princess and the pea. Articulated pieces moved like tectonic plates as the models walked. Theatrical sumptuousness prevailed. At the end of the show, the models held hands as they lined up along the stage, like a cast taking a bow while the audience clapped themselves senseless. That reaction vindicated Kawakubo in her conviction that Sontag was right about camp. If, as Rei believes, the original rebel yell of punk has lost its guts, camp prevails with its enduring outsider status. “It can express something deeper and can give birth to progress,” she said. Maybe that’s what we were looking at. There is no doubt that a spirit of aesthetic excess seems like an inspirational response to the dark, goatish machinations of male power-mongers.